Just recently, my ultra favorite online store had these collection out, my gawd, I've been mumbling - they're gorgeous the whole time I was browsing their site. They call these the 'The Personality Pants'. They look so fancy, playful and the colors are so alive. I'm thinking probably my personality is really plain, looking at my closet the only pants with personality I have is the one I use for sleeping, lol. These crops look great, I've been combing the site for a pair of polka dots, jeje, don't raise yah brow da'lin', this ain't for retro type of look, but for some cultural and personal political reasons ... you know - 'mukha ba akong pera? ', pampaswerte, lol. 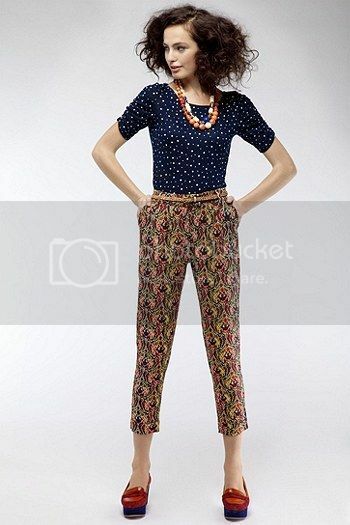 But seriously, they're back, I mean the printed pants and now so-called the 'The Personality Pants'. They're a perfect name to this genre of fashion, your choice would surely show the kind of personality that you have. As always, I'm a minimalist mammal, it's certain I'd opt for not so flashy and gaudy pair. Settle yourself, but one now, they're up for grabs at anthropologie.com.